EZLN: Thank you Part I. 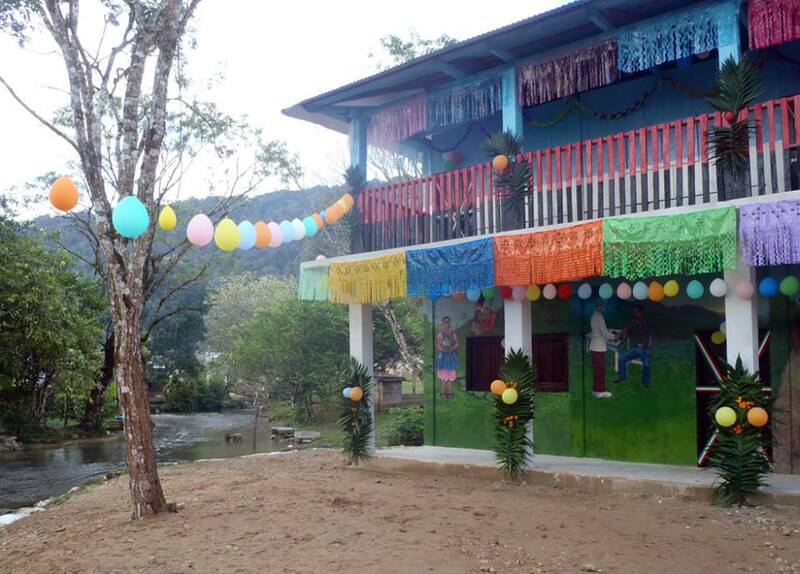 On Sunday, March 1, 2015, after more than six months of work, the building that houses a health clinic and a school was presented to the Zapatista bases of support of La Realidad. The solidarity of people and collectives throughout the world made this construction possible. Here we present to you the accounts, the words expressed during this event, and some photos from that day. -Construction began on July 31, 2014. It was finished at the end of February 2015. -Work days: approximately 2015 compa/work days. Note from The Tercios Compas[ii] on the compa/work day, abbreviated CWD. CWD is a Zapatista unit of measure that could be thought of as equivalent to Socially Necessary Labor Time (SNLT). However, in addition to the fact that it is not measured in hours, CWD is not a unit of measure of value. CWD is a referent in order to compare the individual and the collective (an individual would have taken almost 7 years to do what a collective did in almost 7 months), and to contrast that which is done below and to the left with that which is done above and to the right (a government from above would have taken 14 years and still wouldn’t have finished the job). For example: with billions in their budget, the Chiapas state government cannot finish building hospitals in Reforma, Yajalón and Tuxtla Gutiérrez. The one in Tuxtla Gutiérrez is just one of the examples that abound of the corruption of the “leftist-PRDista-AMLOista” Juan Sabines Guerrero (who, as his predecessor Pablo Salazar Mendiguchía confessed, created and financed the paramilitary group known as CIOAC-H in Chiapas; the Aryan Velasco carries on those same politics). In 2012, to “inaugurate” the hospital in Tuxtla, they moved equipment there from other hospitals. After that psychopath Calderón and the criminal Sabines cut the ribbon, they dismantled everything. Now it is just a shell (information from “Chiapas Paralelo” chiapasparalelo.com and “Diario Contra Poder” diariaocontrapoderenchiapas.com). The Aryan Velasco hides his patron’s enormous fraud and follows in his footsteps. Meanwhile, the money paid out above is spent on media propaganda, binge parties, decor, and makeup and beauty salons. In addition, of course, to being spent on persecuting the small independent paid media that still exists in the state, and buying silence on social networks. It is one thing to use handouts to corral people into praising the Aryan rancher, and a very different thing to organize in order to build what the people need. More information on the concept of SNLT, in Capital, Volume 1, Section 1, Chapter 1. We don’t remember the author, but he was a Jew, so proceed with caution. More information on the concept of CWD later on. End of the note from the Los Tercios Compas, press that is neither free, nor autonomous, nor alternative, nor independent, but it is compa. Copyright still in process because the Junta de Buen Gobierno told us “more information later on” (sonofa….didn’t I tell you?). -Accounting of money received. Total monetary support received: $1,191,571.26 (one million, one hundred ninety-one thousand, five hundred seventy-one pesos and 26 cents, national currency). Total spent on construction: $370,403.84. (three hundred seventy thousand, four hundred and three dollars and 84 cents, national currency). 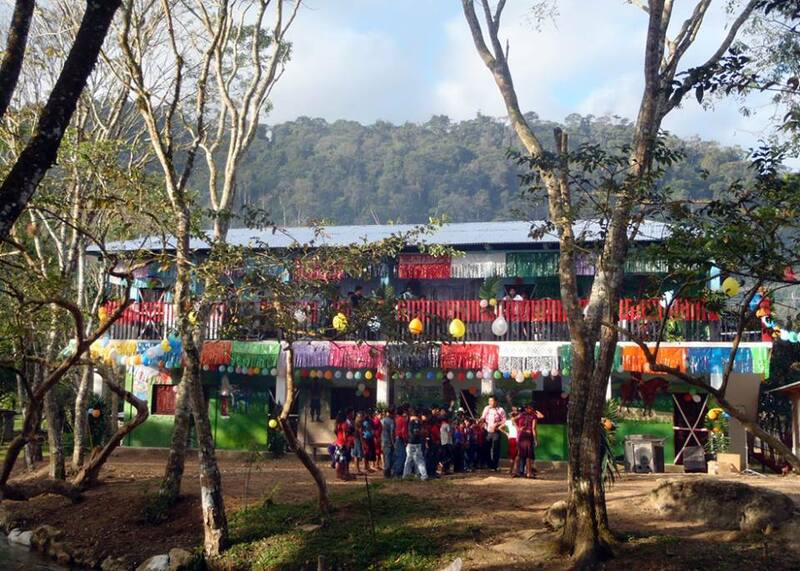 Total spent on materials for equipping the autonomous school and clinic: $102,457.42 (one hundred and two thousand, four hundred fifty-seven thousand pesos and 42 cents, national currency). Cash remaining: $718,710.00 (seven hundred and eighteen thousand, seven hundred and ten pesos, national currency). The purchase and sale of cattle: $200,000.00 (Two hundred thousand pesos, national currency). The purchase and sale of coffee and corn: $100,000.00 (One hundred thousand pesos, national currency). The purchase of a three-ton vehicle to serve the community: $200,000.00 (Two hundred thousand pesos, national currency). Support for a store, cafeteria, and bakery for the compañeras’ collective work: $100,000.00 (One hundred thousand pesos, national currency). For the Zapatista resistance fund: $118,719.00 (One hundred and eighteen thousand seven hundred and nineteen pesos, national currency). Total cash remaining plus expenses: $1,191,571.26 (one million, one hundred ninety-one thousand, five hundred seventy-one pesos and 26 cents, national currency). Thus the accounts balance and are now closed. Now all that is left is to continue struggling. The words of compañero Jorge, Zapatista base of support for the EZLN. 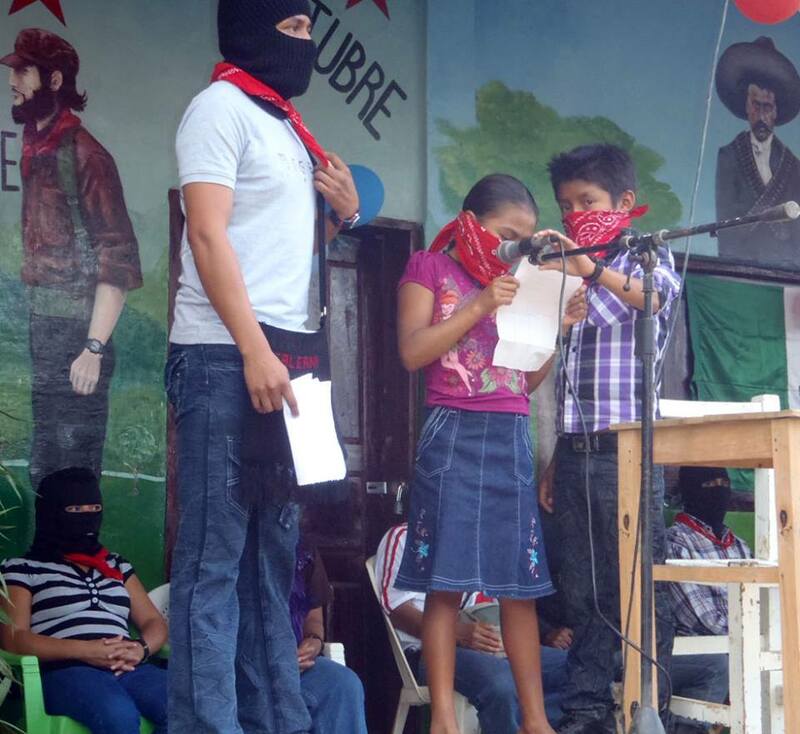 In Zapatista La Realidad, at the inauguration of the Autonomous Zapatista School “Compañero Galeano” and the Autonomous Clinic October 26 “Compañero Insurgente Pedro,” on March 1 2015. Good morning compañeros and compañeras. I would like to say a few words as the compañero in charge of this community. The capitalist government wants to destroy our autonomy and put an end to the EZLN, but we know well that they will never be able to do this, because whatever the bad government destroys, our autonomy [re]builds. We will continue to exercise and increase our autonomy and our resistance as the EZLN because we well know that the ones who don’t resist are those who are fooled by the bad government and paid to destroy things. But they won’t achieve anything with their depraved ideas. It is a shame that there are people who allow this, who let themselves be used by the bad government, and don’t realize how they are manipulated and deceived by the crumbs that the bad government throws them. All of this that I am describing here is no lie, because what they destroyed is already reconstructed much better than it was before, so that the bad government can see that as Zapatistas, we [re]build what they destroy. And everything that happened on May 2 is not just about us here, but also shared by the national and international Sixth and the world. 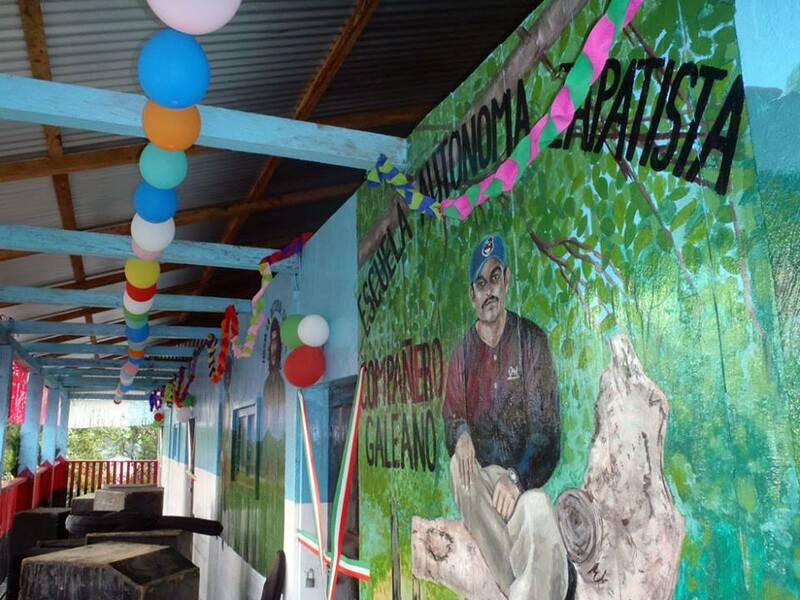 That is why we, as the EZLN, are here with the compañeros who are authorities in this zone to receive our new school and clinic, because what happed to our compañero Galeano is unforgettable. We also thank the compañeros of the national and international Sixth who offered their support for the construction of our new school and clinic in this Zapatista community, La Realidad, with special thanks to the compañeros from France, Italy (inaudible) and the other compañeros who offered their support. For all of this, for what happened on May 2, the government has not done justice, because we know that it is a corrupt and murderous government. I also want to let you know that later on we will continue with another homage that will be held elsewhere, on May 2. Our compañero Galeano will never be forgotten because he struggled for the people and carried out his duty as a Zapatista. Words of the Indigenous Revolutionary Clandestine Committee of the EZLN, in the voice of Comandante Tacho. Good morning compañeros. Good morning everyone. In the name of the Indigenous Revolutionary Clandestine Committee of this zone and of the other zones that accompany us in our homage to our compañero, I will allow myself a few words on behalf of all of the compañero bases of support, milicianos, insurgents, the General Command and the entire EZLN. 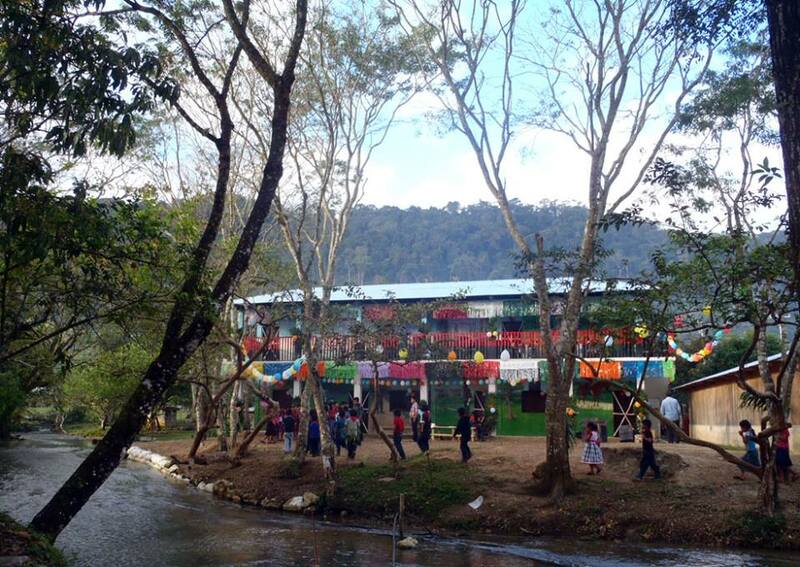 Today, March 1, 2015, the bases of support of our Zapatista Army for National Liberation in the Selva Fronteriza zone are witness to the conclusion of the construction of the autonomous school and the health clinic belonging to our compañero bases of support in resistance of the community Nueva Victoria, known as La Realidad, Chiapas, Mexico. Our school and clinic had been destroyed under the orders of the three levels of bad government, paramilitary boss Manuel Velasco, and supreme criminal boss Peña Nieto, and those who organized the destruction of the autonomous school and the health clinic of our compañeros and compañeras, along with the cruel and cowardly punishment of our unforgettable compañero Galeano, zone-level teacher for the Little School for Freedom According to the Zapatistas, on May 2, 2014. 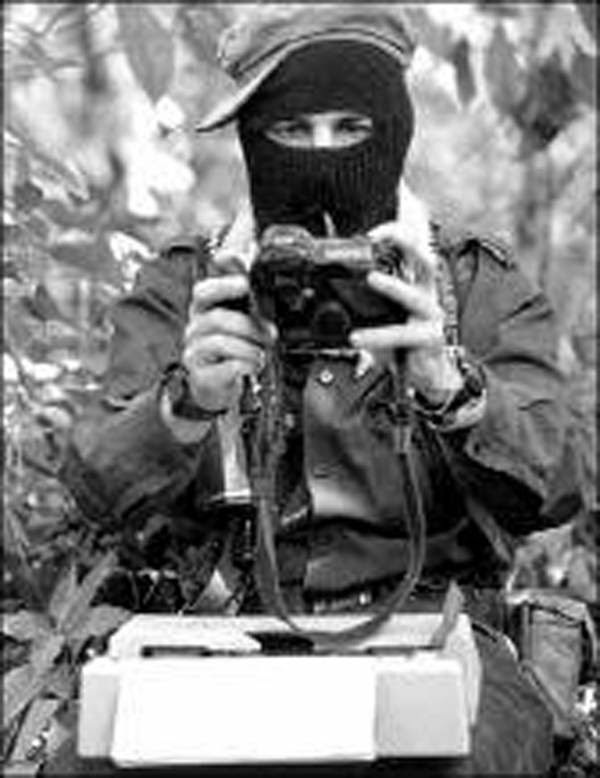 The bad governments’ plan is to do what it can everyday to destroy the autonomy of our Zapatista people in resistance, of the Zapatista Army for National Liberation. The rotting death of this bad neoliberal capitalist system has organized counterinsurgency methods to provoke confrontations between villages and Zapatista communities, which they then use to justify military intervention. It is clear to us that all of the acts of provocation by paramilitary groups paid and trained by these bad governments are meant to destroy the resistance of our people. That is why today, March 1, 2015, we thank the compañeros and compañeras of the Sixth in Mexico and the International Sixth across the world, and all noble and good people who expressed solidarity with our struggle. On behalf of our Selva Fronteriza zone, caracol Mother of the Caracoles, Sea of our Dreams, we give you our thanks. 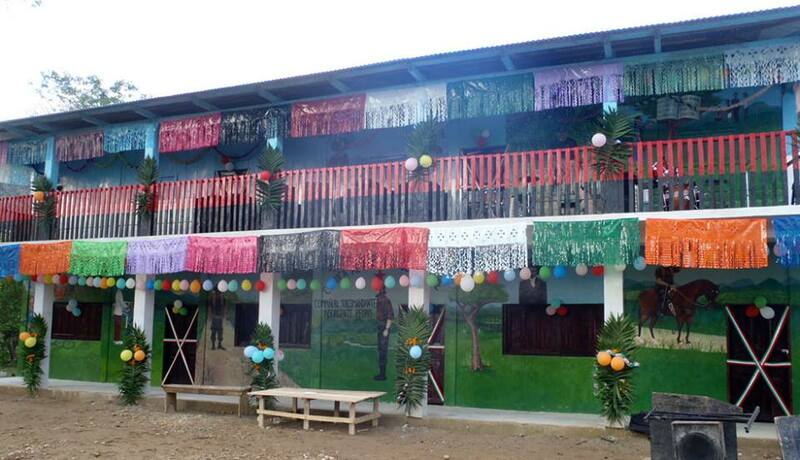 Because of your solidarity and economic support, we were able to rebuild the autonomous school and health clinic. We are very grateful that together we have been able to build what the bad governments dedicate themselves to destroying. All of this is a fact, and provides more proof that when we are coordinated and organized we can change our lives, building from below and to the left new things for the good of the people, for and from the people. That is why today in this Selva Fronteriza zone we accept your great support and solidarity in the construction of the school, called Companero Galeano Autonomous School, and the clinic, called 26 of October Compañero Subcomandante Insurgente Pedro Autonomous Health Clinic. Thank you, compañeros and compañeras of the Sixth in Mexico. Thank you compañeros and compañeras of the International Sixth across the world. Thanks to the solidarity organizations who provided economic support. Thanks to the noble and good people for your support and solidarity. La Realidad, Chiapas, Mexico. Caracol I “Mother of the Caracoles. Sea of our Dreams.” March 1, 2015. PHOTOS, GOSSIP, CRAMPS, AND NON-SCIENTIFIC REFERENCES courtesy of Los Tercios Compas. I don’t know, maybe it’s just a supposition, but it could be more profitable to try to convince the millions that are going to vote anyway to vote for you, rather than attacking those who aren’t going to vote or who are going to cancel their votes or whatever. Because responding to skepticism with arguments along the lines of “peñabots”—“go get your sandwich and your juice box”; “not voting is a vote for the PRI,” and their equivalents—in addition to being the same arguments used by the PANistas and their PTistas and PRDistas allies and the rest of them, are, well, how to explain? Hmm…okay, in the nicest way possible: the level of argument is an indicator of the level of intelligence and the command of language. Or maybe it’s that you already see that you’re not going to come out ahead and you are looking for someone to blame? No come on! Get excited! The funding is set up, the [party] registration is filed, the right environment, press, leader, structure, and tribunals have been put in place, and there is a candidate for 2018, 2024, and 2030, and so on! Oh, what, you’re lacking ideas? Imagination? Shame? A politics of smart alliances? Oh well, “Quod natura non dat, INE non præstat”(from the Latin “that which nature has not given, the INE [National Electoral Institute] will not provide). But, that’s ok! There is always the option of creating another par…oh oh, there’s citizen Card—– raising his hand! -Pst, pst. They should have appointed Deepak Chopra to a position or put him in charge of the party’s strategy for science and culture. It would surprise you how many cultured people would put aside their skepticism and vote. Hmm…although it’s true, it may be a vote against you. -Another reason NOT to rely on Twitter as a source of information: reading about the topic on Twitter you would conclude that: islamophobia = a fear of islands. [i] Pozol is a highly nutritious drink made from ground maize mixed with water. It is commonly consumed in the Mexican countryside as a midday meal.